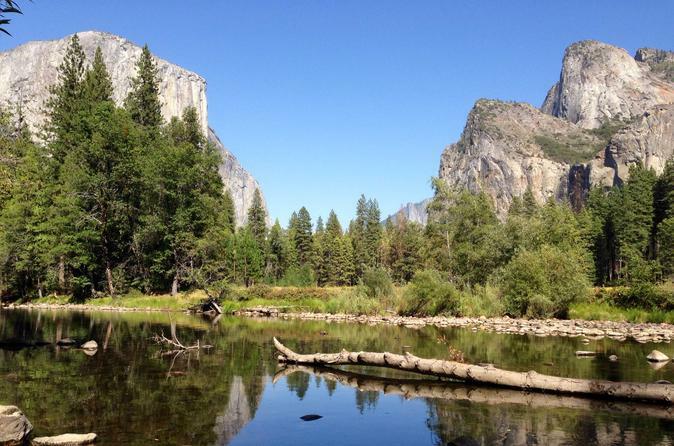 Yosemite National Park is a true California experience. Immerse yourself in the majestic granite cliffs, waterfalls, clear streams, giant sequoias groves, and biological diversity. Nearly 12000 square miles, over 800 miles (1,300 km) of trails are available to hikers, anything from the easy stroll, to the grueling hikes up several park mountains, to multiple-day back packing. Your visit to Yosemite can be completely customized to suite your time, interest, and activities: from a long and rewarding day trip, to a two day guided activities, with leisure time to explore the valley on your own, or go on a grueling multiple-day back packing through the high country, it will be an adventure of a life time. Cathedral Falls, Yosemite Falls, Tuolumne Flats, view the entire valley floor from Inspiration point, and the Tuolumne River and Half Dome from Glacier Point are just a few majestic points in the park. With a range of accommodations—from elegant hotels with exceptional service to simple canvas tent cabins—you’ll find the perfect place to settle in, surrounded by some of the most majestic natural wonders on earth.